In lieu of participating in a ton of swaps this year, I thought I'd try this whole virtual quilting bee thing. Almost all of my blog friends participate in one, or in most cases a lot more, online bees. They all operate a little differently. I joined one started by Traceyjay called the VIBees (that's for Very Important, dontcha know!). Each of us will have a month where we send out packages of fabric to the other 12 participants with instructions for the block we want them to make. January belongs to Cherie and she's having us make kitchen window blocks similar to the quilt in Elizabeth Hartman's new book. She sent a lovely package of Meadowsweet II with Kona coal and stone for sashing. We had to design the windows part of the block ourselves. Graph paper is my friend. It's a good thing I liberated several computation pads from my last job! I even did a set in square for the first time and it worked out perfectly. Can you spot it? Is it the magenta flower? I Love this block! I believe the set in square is the large scale flower in pink/purple/magenta. Nice piecing job..as always!!! Looking good! Congratulations on the set in block! It look perfect! It looks wonderful, but what is a set in square? They all look beautiful. What a beautiful block! and ditto on Judi's question! i don't know what a set in square is either. but I want to hazard a guess. it's the one Dianne said because... you would have to take the two L shapes formed by the rest of the blocks and then SET IN the square within the two L shapes to form your block... I don't know... thanks for the quiz! keeps the mind sharp! I've never participated in a bee. But sure does sound fun. How cool is that? 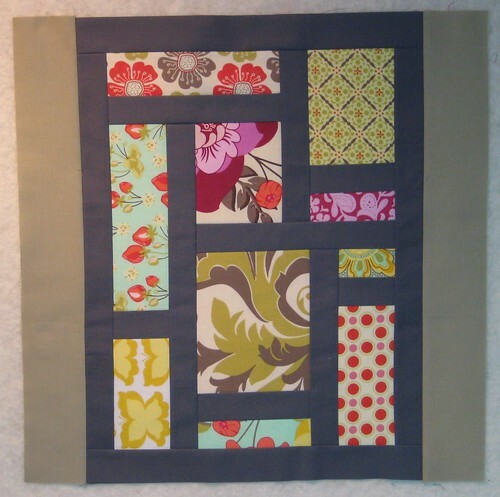 I'm always keeping my eyes open for possible quilting bee blocks.